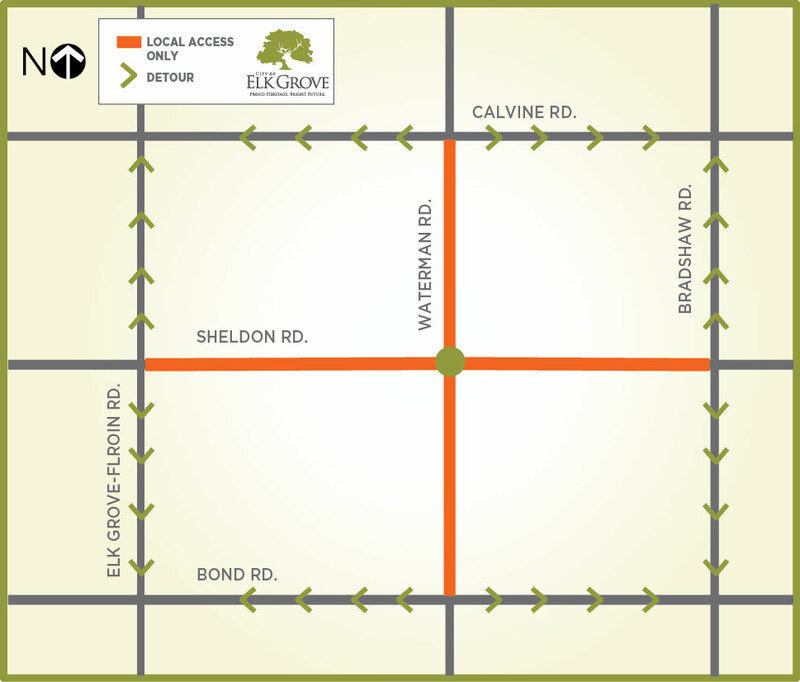 The City of Elk Grove Public Works Department will close the intersection of Waterman and Sheldon Road for 30 days beginning July 5 to construct one of two roundabouts approved for the rural Elk Grove area. Closure Period: A full closure of the intersection at Waterman Road and Sheldon Road is scheduled from July 5 until August 3. Increased Travel Times & Detours: This closure will impact all through traffic on Waterman and Sheldon Roads. 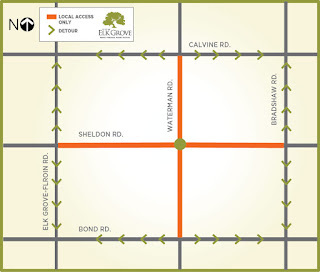 Motorists are advised to use either Bradshaw Road on the east, Elk Grove-Florin Road to the west, Calvine Road to the north, or Bond Road to the south to bypass the closure. Detour signs and electronic message boards will be in place to divert traffic around the work site. Access for emergency vehicles and property owners in the area will be maintained during the closure. The City of Elk Grove understands the challenges and inconvenience that commuters, residents, businesses, and pedestrians will experience during the closure period and ask for the public’s patience and cooperation as we work to complete this project as quickly and efficiently as possible. Construction Activities: Crews will be installing a single-lane roundabout with a separate westbound right turn lane from southbound Waterman Road to westbound Sheldon Road. Improvements will include pedestrian accessible crossings at the intersection (roundabout), drainage improvements, and other landscaping features. Re-opening: The roadway is scheduled to re-open on August 4, 2016. For questions or more information, please contact the Public Works Department at (916) 627-3315. I can hardly wait until their rush-hour debut. Multiple lanes (don't get caught in the inside lane! ), and pedestrians/cyclists, suicidal. The roundabouts instead of signalized intersections are to appease the rural residents who still cling to the notion that their area is somehow still "rural". Large lots in the midst of the commuter travel routes do not make rural! How/why would someone get into the inside lane of the roundabouts? You'll need to get out sometime, eventually unless you like the feel of carnival rides like the teacups! Lane changing in the roundabouts? I can hardly wait to see this! Modern roundabouts are not the same as rotaries. The inside lane can exit based on where you entered, just like any other multi-lane intersection.